Son of Ann and William of Shoalhaven Street, Kiama. “Junie” was a labourer who was a prominent member of the Kiama Rifle Club, and captain of the football club. “Junie” enlisted in the 2nd Battalion A.I.F. on 28 August 1914, and embarked from Sydney for active service on 18 October 1914, onboard HMAT Suffolk. 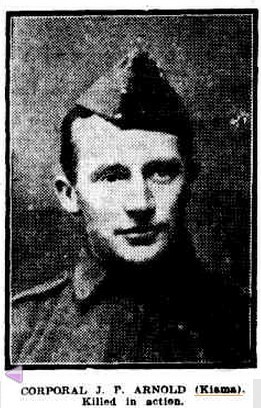 Private Arnold was promoted to Corporal on 21st May, 1915. Just prior to this he was hospitalized at No.2 Australian General Hospital. Mena House, Cairo, with influenza. Corporal Arnold’s 2nd Battalion was chosen to take part in the initial assault on Lone Pine between 6 and 10 August 1915. After gaining possession of the main enemy line, the Australians were subjected to a series of determined counter-attacks which would last the next three days, which, although successfully repulsed, proved very costly for the Australians. The 2nd Battalion suffered considerably. Having started the action with 22 officers and 560 other ranks, they lost 21 officers and 409 other ranks killed or wounded. Corporal Arnold was killed in the period of 6th – 9th August 1915, with his body never being retrieved. He is believed to buried at the Lone Pine Cemetery, Gallipoli, where his actual grave is unknown.